Zero Day is a 2003 American film directed by Ben Coccio about a school shooting. It was inspired by the 1999 Columbine High School massacre. 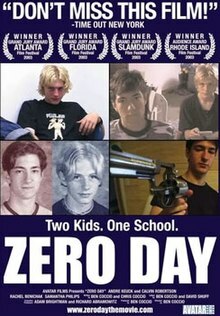 Andre Kriegman (based on Eric Harris) and Calvin Gabriel (based on Dylan Klebold) announce their intention to attack their high school, calling their plan "Zero Day". They keep a video diary on the camera, carefully hiding it from their friends and families. The majority of the film is portrayed through their video filming, and shows them planning, preparing, and explaining some of their motives. Other scenes show the two attending Andre's birthday party, egging the house of someone they dislike, and Cal going to the prom while Andre works at a pizza place. In one video entry, Cal notes the origin of the name "Zero Day": Cal and Andre originally planned to attack on the first day on which the temperature dropped to zero degrees after they had finished their preparations. This plan soon proved impractical, and they set May 1, 2001 as the new date. Wanting their attack to have a memorable name, they agreed to keep the original title. The second to last scene of the movie shows the boys arriving at school on May 1 and preparing their plan and weapons in Andre's car. Andre says that he could never have carried out Zero Day without Cal's help, a sentiment Cal echoes. They run into the school, armed with three pistols, an M1 carbine, and a 12-gauge pump-action shotgun, all stolen from Andre's father and cousin. The shooting is shown through the viewpoint of security cameras very similar to Columbine High School massacre's view. The dialogue is heard via the cellphone of a student who is shot and killed. Shooting at anyone they see, Andre and Cal eventually see law enforcement arriving in force after sixteen minutes of shooting. After arguing over whether to engage the police in gunfire, the pair decide to count to three and shoot themselves. The next scene is set on May 10, nine days after the shooting. A group of youths film themselves going to a park where memorial crosses are standing. They say that Andre and Cal killed twelve students and themselves. Finding crosses for the pair, they set them on fire and run back to their cars. The last scene shows the two crosses burning. Ben Coccio recalls that he was in a Brooklyn pizzeria on the day of the 1999 Columbine High School massacre, and saw coverage of the event on the eatery's television, commenting, "I remember thinking that I was surprised that it hadn't happened sooner." Coccio was also struck by the extent to which Eric Harris and Dylan Klebold planned that shooting, compared to the impromptu crimes of passion that typified other school shootings. Coccio became eager to address the story in a way that was not exploitative, and drew upon his own views of high school as a place of tension where "anything could happen at any time". Coccio's theory of student school shooters is not that they are the most bullied, as such students tend to develop feelings of inferiority and are likely to harm themselves. Coccio feels that shooters tend to be students with feelings of superiority, and that "when other people don’t confirm that, it really gets under their skin." None of the numerous Connecticut high schools where he sought to film the movie would allow Coccio access, and he ended up using the interior of a building at State University of New York at Purchase in Purchase, New York. The "appropriately fortress-like" exterior of the High School was New Milford High School in New Milford, Connecticut, where Coccio lived at the time. When casting, Coccio inquired at high schools throughout Connecticut looking for teenagers interested in acting who might not have much or any professional experience. Coccio had three days of open auditions. Andre Keuck responded to an ad Coccio placed in Backstage Magazine and brought his classmate and fellow theater enthusiast Cal Robertson along to the audition. Both boys had acted in Shakespeare productions at the Stratford Avon theater in Stratford, Connecticut. They were encouraged to improvise throughout the film's production. Zero Day has received mostly positive reviews from critics, currently holding a 68% approval rating on Rotten Tomatoes, as well as a 74% audience approval rating. Despite the positive reception from critics and audiences, Zero Day was a box office bomb, gaining only $8,466 against a $20,000 budget. ^ a b Roeder, Amy (September 1, 2002). "Zero Score". New England Film. Archived from the original on February 5, 2010.